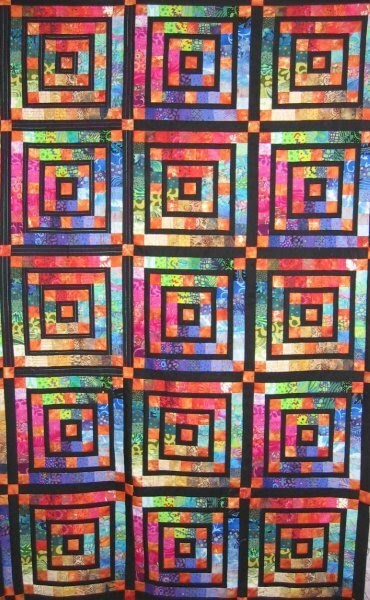 Jan Hassard has just sent us a photo of the quilt she is making for her next workshop at Busy Bees. The one day class is called 'Infinity Squares'. Jan has taken her inspiration from artists of the Op Art school. 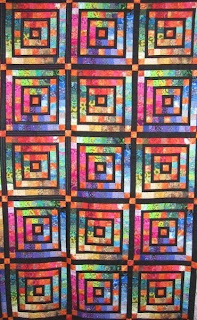 This design continues her series of unusual log cabin illusionary quilts, exploring squares within squares. As with all Jan's work colour is the key element. I think you will agree this wall-hanging really does sing. It is very rare for us to have any places left on Jan's workshops, but this time a few people haven't been able to make the date. If you would like to be a member of this class, get in touch by ringing the shop on 01633 810801. I can guarantee a very enjoyable and informative time. The class is being held on Saturday February 12th 2011 at Duffryn Community Centre, which is very near Busy Bees shop.The class runs from 10am to 4pm at a class fee of £35.00 for the day. I have just come across an old P&Q mag from 2008 and started reading it. I enjoyed the write up on yourselves and as I am relatively new to patchwork I must admit to getting some inspiration from you. The website is brilliant & and exceptionally informative. Wasn't sure what to put as a comment profile so will probably have it wrong ! !